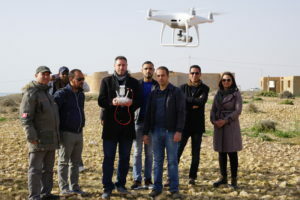 Tunisian colleagues were able to gain permits to bring two unmanned aerial vehicles to Tunisia. These UAV’s were used to map the areas around Iunca and to collect individual oblique shots of the archaeological site. The flights on 5thand 6thFebruary, 2018 were used to show the potential to the participants and to train on the basics of the flights. In particular, each participant had an opportunity to take-off and land the UAV and also to take the pictures (Figure 1). Fig. 1 Training with two DJI UAV’s in progress. The process started with a classroom session on the basics of the UAV usage and the safety considerations. It included a presentation on examples of UAV use in other parts of the world and the benefits that were achieved in similar environments were discussed in detail. Then a brief introduction was made into grid flight planning and the benefits of overlapping aerial photography (Figure 6). Once on the field, several grid-flights and several free flights were conducted to gather substantial number of aerial images (over 3,000 individual images, with additional videos). The flights were conducted below 50 metres and the equipment was always kept in a safe distance. The aerial images were then processed using photogrammetric software and the benefit of the results were demonstrated to the participants. It was particularly useful to have the equipment with ability to georeferenced the images (Figure 7). The ability of participants learning these highly-technical skills quickly was subject to their prior knowledge and skill level. It was clear that two days of flights were simply not sufficient to train everyone to a necessary level where they can work fully independently. This was an important beginning of the process. The next training sessions should aspire to allow for more days of flying the UAV and processing the data in order to achieve an ultimate goal of making every trainee competent and independent operators.